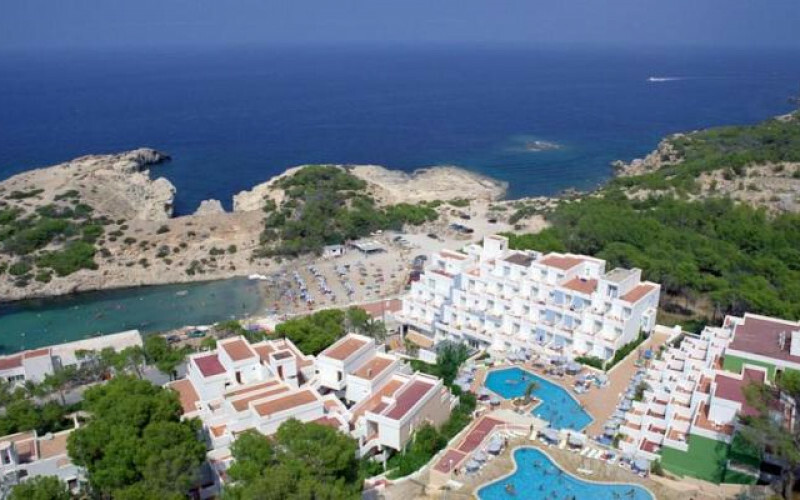 Paradise Beach Aparthotel is located next to the smallest of the beautiful bays of Portinatx and amongst the wonderful green trees and the natural landscape that Ibiza is known for. The local bus runs through the resort for those who want to explore this beautiful island and what it has to offer, and if you just want to ride through the local area, the Paradise Beach Aparthotel offers a free bicycle rental which is a really great family day out. Just a short stroll from the hotel are the bars and restaurants and for those gifts to take back home to friends and family are the shops selling beautiful items that have been carefully made by hand on the island. There is also a small water park close by and the many water sports can be tried just a few hundred yards, on the main beach of Portinatx. The hotel lobby has a modern seating area with vending machines and an internet corner. For those wanting to add their latest post on their phone, they can enjoy the free Wi-Fi that is available in most public areas. Paradise Beach Aparthotel has a 24 hour reception desk where the staff are always available to assist in services such as currency exchange, luggage storage for those guests returning on a late flight home and there are also beach towels provided for a small deposit. In the lobby area, there is a tour desk offering tourist information and excursion ticket sales. Outside are two large swimming pools on different levels with an abundance of sun loungers with parasols spread around the spacious sun terraces. There are many activities that take place in the pool for the whole family to enjoy and there is a pool bar offering a variety of snacks and drinks throughout the day. For the children, there is a section of the pool that is just for them, a playground, giant chess board and there is a kids club with many games and activities organised by the entertainments team. In the evening the guests have a choice of the buffet style restaurant with regular themed nights and there is also the beach club that is on the beachfront and has stunning views out to sea. At the beach club, there are fun games for the children to enjoy such as air hockey, table football and billiards and it offers casual dining and a takeaway service. The evening continues on to the pool terrace where the entertainments team have carefully organised a variety of fun shows on the stage that will suit the whole family. Paradise Beach Aparthotel has over 130 rooms that consist of studios and one bedroom apartments. They all have twin beds, kitchenette and dining table with chairs, TV, telephone, safe and a modern private bathroom with a hairdryer. The one bedroom apartments have a separate bedroom with ample wardrobe space and all rooms have air conditioning and a private balcony furnished with a table and chairs. Each block has a maximum of 5 floors that all face out onto the pool and some of the lucky ones also have amazing views out to sea. There are lifts to all floors, and the complex has been adapted to allow people with wheelchairs to gain access to all areas. The Paradise Beach Aparthotel is a great complex that has a fun atmosphere through the day and night and would suit couples and families looking for great value for money.